The entire life of Our Lady from her Immaculate Conception to her glorious Assumption is a symbol of the whole life of the Church and of our own spiritual lives. The history of the Church begins in the womb of the Virgin. Mary and the Church are two, yet one single mother, two virgins, yet one. Each is virgin, each is mother. Both conceived of the same Holy Spirit, without human seed. Both bore to God the Father a Child unblemished. Both are the Mother of Christ, but neither can bring Him to birth without the other. The Church in the development of Her piety is guided by the Holy Ghost, and devotion to Holy Mother the Church cannot possibly run counter to our devotion to the Mother of God. The whole mystery of the Church is inseparably bound up with the mystery of Mary. We need to learn to see Our Lady in the Church and the Church in Our Lady. Our Blessed Mother is the Bride of the Holy Spirit and the Church is the Bride of Christ. We must be spiritual men to comprehend the mystery of Mary in the Church. What is needed, today, is a return to the Heart of Mary, so that our love of the Church as our Mother may grow together with our love for the Mother of Jesus. God’s first words of salvation spoken outside the locked gates of Paradise indicate a woman, “I will put enmities between thee and the Woman, and thy seed and her seed; she will crush thy head and thou shalt lie in wait for her heel.” (Gen.3:15) The Lord hath spoken it. Satan is cast out of Heaven. The mystery of the Immaculate Conception is not only a personal privilege granted to Mary who was to become the Mother of God but also, through it, Mary becomes a figure of the Church. The Church is, therefore, the Woman fulfilling both Eve and Mary; She is at war throughout history, and Hers is the victory at the end. The Immaculate Conception of the Mother of God is, in the deepest sense, the consummation and the reality of our own personal salvation. The final battle is still to come, for the serpent lies in wait for the Woman’s heel. Look well at the Woman in the sky clothed with the sun, crowned with twelve stars, and with the moon spread underneath her feet; yes, it is indeed she, our Mother, it is indeed the Church. We can certainly say that the Woman of the Apocalypse is Mary, because she is the Mother of the Church, having given birth to the Head of the Church, and herself being the Daughter of the Church, and the holiest of its members. The virginity of the Church means that She preserves intact Her faith in Christ. Heresy means loss of that virginity; it is breaking off the betrothal to Christ. Early Christians said that the Church, like Mary, is ever virgin and can never fall into Eve’s unfaithfulness. This is no more and no less than we say today with our doctrine of the Church’s infallibility. Heresy is unchaste; it is adultery towards Christ. The mystery of the perpetual virginity of Mary is dogma: A chaste womb shelters Christ in His physical and in His mystical Body. Every time, we proclaim our belief in the Church, we are paying honor to Mary; and every witness of our love for Mary is a witness of our belief in the Church, for in Mary the Church became the Virgin Mother of God. What happened with Mary through the overshadowing of the Holy Ghost, is daily renewed mystically within the Church. The Church is in labor and travail, until Christ is formed in us and born of us. Whoever has childlike devotion to Mary, has found entrance to the deepest mystery of the Church. Mary is, indeed, the Mother of Christ’s members, that is, of ourselves. It is by her love that men have been born in the Church. It is through the mystery of the marriage, both human and divine at the incarnation, that our redemption began. 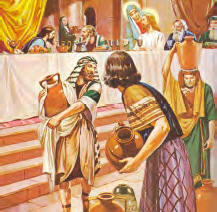 The deep significance of the marriage at Cana and the wedding feast is critical to our understanding of both Mary and the Church. Humanity is being changed into the wine of the life of grace while Mary is there. 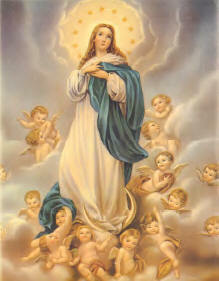 She is the Mother of all who are sanctified by their faith in coming to God. Whatever errors be taught in the false services of infidels, come from a denial of the incarnation which begins with a refusal to honor God’s holy Mother and, which continues with a rejection to honor the virginity of the Church. Where the mother of Jesus is not, there can be no marriage! Jesus at Cana spoke of His hour ‘which was to come,’ the hour of His Death on the Cross, when His Blood was poured out for man’s salvation. On Calvary, the Church was given to Mary, “Woman, behold thy Son!”, and Mary was given to the Church, “Son, behold thy Mother!” Mary and the Church are one: The Woman at the foot of the Cross is the Woman of promise who would overcome Satan. Beneath the victorious Cross of the dying God stands the Woman who has won all of God’s battles, the holy Ecclesia! How lovable she is, this Mother of ours! Let us offer thanks to the Father and to Christ, Our Brother, that we have the privilege to be the Children of Mary, Our Mother, and of Holy Mother the Church. There can be no contradiction between a tender devotion to Mary and a deep love for the Church. The Church is Mary in the world. In this journey through everyday life to the Cross, we find a new aspect of the mystery of Mary and the Church: the mystery of her inner strength amid ordinary life, unswerving faithfulness to Christ and powerful patience which enables her to go with Christ to Calvary and share in the joy of His Resurrection. Mary’s acceptance of the Incarnation was her acceptance of death. She gave her blood to Him, only that He might shed it for us. In Mary and in the Church, the destitute world becomes rich, and starving mankind is fed lavishly. Love is the fruit of our Baptism. 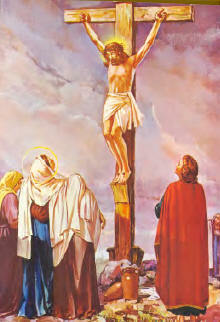 It is by the spindle of true love in our every day tasks that we learn to meet Christ Crucified. Only on the Cross is found the true measure of our love. Pentecost is the very pinnacle of our Redemption because the charity of God is poured into our hearts. Here, indeed, is fulfilled in all mankind what was begun in the heart of the Virgin at the Incarnation. The Heart of Mary is the beginning of the story; in her heart was performed in secret, what now at Pentecost, is open to the gaze of all mankind. The heart of Mary is the original upper room, where all redeemed mankind is gathered. Her heart is the vessel filled by the Holy Spirit. In her, we find all prophecies are fulfilled; in her begins the life of heavenly glory! Everything has its beginning in the Heart of Mary, and in her womb. The heart of the mystery of the Virgin Mary and the virgin Church, is the humble obedience of faith which opens itself in complete love and trust to the Holy Spirit Who overshadows her. In the midst of her heart, Eternity entered Time! The Church’s history on earth is already a heavenly mystery: for She is always on the point of extinction. She is frequently persecuted and abides on the hill of Calvary. She is clothed with the sun in her heavenly glory and yet upon earth is always in the pains of childbirth. And, so it is true of the Christian who is in travail until Christ is formed in him and born of him. This new birth can happen only by dying to himself each day, that he may receive the life of God’s glory. The final history of the body of the Woman who gave birth to God is the Assumption, the fulfilling in advance of what is promised to the whole Mystical Body of Christ. 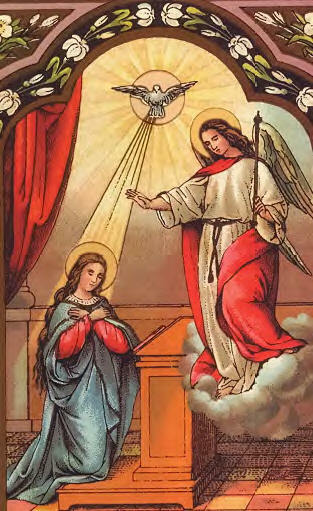 The prince of this world, the devil, was already defeated by the Woman, when the Word of God became the Fruit of her womb: “Behold, the handmaid of the Lord, be it done unto me according to Thy Word. THE ETERNAL FIAT!” The final glory of Mary is the final glory of the Church. When the Church celebrates the Assumption, She is celebrating her own final glory. 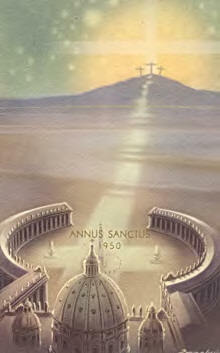 Jesus and Mary are preparing for us a new paradise, which is the Church in all Her glory. Mary is always present within the Church in her express title, “Mother of Grace”. In her painful pilgrimage here on earth and through her painful history and purification by persecution, Holy Mother the Church must become like to Mary, who without blemish gave birth to her Son. Only then, will the Church wash away every blemish in those she brings to birth through Baptism. This entry was posted on Monday, March 12th, 2012 at 12:09 am and is filed under NewsFlash, Saint Philomena. You can follow any responses to this entry through the RSS 2.0 feed. Both comments and pings are currently closed.